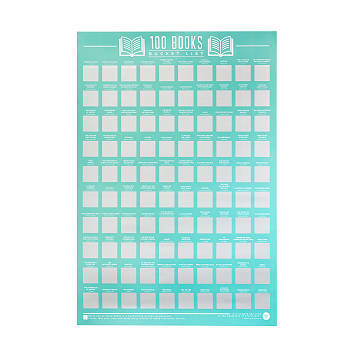 These posters invite you and the kiddos to read your way through 100 iconic books. From Wonderland to the Seven Kingdoms of Westeros, these posters invite you and the kiddos to read your way through 100 iconic books. As you do, use a coin to scratch off each title and reveal the literary artwork underneath. The collections cover classics like James and the Giant Peach and Wuthering Heights, as well as works in the contemporary canon like The Hunger Games and American Psycho. It's an interactive way for any bookworm to enjoy essential reading. Made in the UK, which gave us Macbeth, Pride and Prejudice, and the Harry Potter series. View our PDFs of all 100 Books and all 100 Kid's Books.